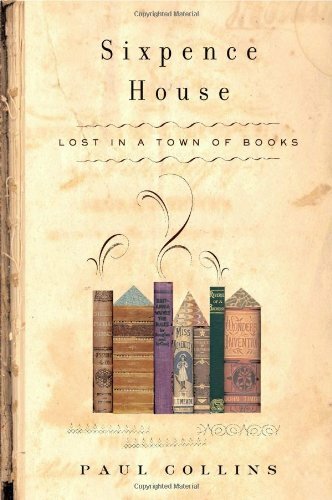 Sixpence House: Lost in a Town of Books is a wonderful ramble that follows the author's move from San Francisco to the small Welsh town of Hay-on-Wye. Hay-on-Wye is a town of 1,500 inhabitants and 40 bookshops, mostly of the antiquarian variety. The population of this small town has its share of odd characters and Collins spends much of Sixpence House describing these eccentrics and their eccentric book collections. Sixpence House is rambling, rather like a second hand bookshop where one subject area blends into another and the books often spill from the shelves and flow onto the floor. You never know what you will find and are sometimes surprised by a true treasure. Collins gives an account of his excursions about Hay-on-Wye and the surrounding countryside, inserting snippets and quotes from often obscure books to highlight his storytelling. Sixpence House was a delightful book by a witty author that gave me a peek into a culture that, though similar, definitely differs from my own. I remember reading this years ago and loving it so much. I still hope to visit Hay-on-Wye one day. Vasilly: I hope to visit there someday too! I desperately need a summer long trip to Great Britain. Vasilly: Oh my! Hadn't thought of that!